The following students have been chosen as September Students of the Month at Lynchburg-Clay Elementary School. To be chosen, these students must have been positive role models for their peers, as well as proven trustworthy and helpful within their school. 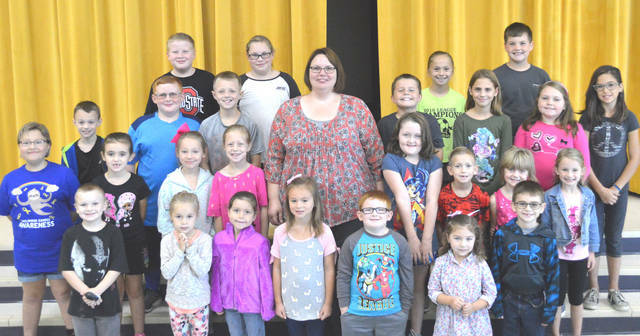 Pictured, with grade in parenthesis, are (front row, l-r) Jayden Pack (1), Mylah Knisley (K), Alyssa Mozingo (K), Lydia Rosselott (K), Kolstin Knisley-Didonato (K), Addelynn Osborn (PK) and Mason Smith (1) (second row) Olivia Furbee (2), Addison West (1), Lillian Curry (2), Shaylynn Mozingo (2), Principal Mrs. Godby, Jasmine Woods (2), Luke Flowers (2), Jocelyn Hawkins (1) and Addison West (1); (third row) JJ Pennigton (3), Hayden Stratton (3), Colton Warnock (3), Carter Faust (3), Leila Hughes (4), Chloe Baker (4) and Brianna Garrett (4); (fourth row) Max Baker (4), Abby McGuire (5), Kaylee Thompson (5) and Kaden Vilvens (5). Absent from picture were Cole Powers (PK) and Gage Thompson (5). https://www.timesgazette.com/wp-content/uploads/sites/33/2018/10/web1_LC-Students.jpgThe following students have been chosen as September Students of the Month at Lynchburg-Clay Elementary School. To be chosen, these students must have been positive role models for their peers, as well as proven trustworthy and helpful within their school. Pictured, with grade in parenthesis, are (front row, l-r) Jayden Pack (1), Mylah Knisley (K), Alyssa Mozingo (K), Lydia Rosselott (K), Kolstin Knisley-Didonato (K), Addelynn Osborn (PK) and Mason Smith (1) (second row) Olivia Furbee (2), Addison West (1), Lillian Curry (2), Shaylynn Mozingo (2), Principal Mrs. Godby, Jasmine Woods (2), Luke Flowers (2), Jocelyn Hawkins (1) and Addison West (1); (third row) JJ Pennigton (3), Hayden Stratton (3), Colton Warnock (3), Carter Faust (3), Leila Hughes (4), Chloe Baker (4) and Brianna Garrett (4); (fourth row) Max Baker (4), Abby McGuire (5), Kaylee Thompson (5) and Kaden Vilvens (5). Absent from picture were Cole Powers (PK) and Gage Thompson (5).